I got these for you! 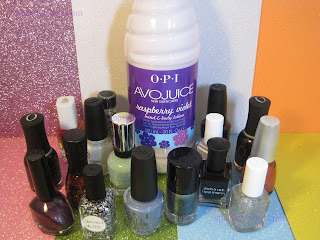 ...and a 20 oz OPI AVOJUICE which smells delicious! awesome lots of pretty cute goodies!!! thanks for the giveaway! :) i can always use more nail polish!! WOW Awesome! Thanks for the giveaway!! This is literally the BEST giveaway I have ever seen..
What I wouldn't do for Connect the Dots!! ahh... awesome! Okay, I'm preeetty sure I just died. @ all: thank YOU for being awesome!!! ok LOVE the background fro your entry form! Sheep always make me happy - hehe I'm a New Zealander. You are so cool for including Connect The Dots!!!!! & TMI! AND the brand spanking new OPI!!!!! fingers crossed I tells ya! Weee! Thanks for hosting a great giveaway! what a great giveaway... thanks for the opportunity!